The product that I was the MOST excited to try was the Klorane Gentle Dry Shampoo with Oat Milk. I have a million and one different dry shampoos. Some I love, some I hate, but none have the quality that this dry shampoo does and that is why I was so excited to try it. It is not a clear dry shampoo as it sprays on white, but it does mix in well and the color disappears as it is brushed through hair. The great part about this dry shampoo is the calming capabilities that the scent carries with it. I sprayed throughout my hair on a day that I was too lazy to carry out a proper hair washing. I immediately breathed in a calming and gentle scent as my hair was reverted to its original soft and revived nature. I love this new dry shampoo and will probably buy a full size version when this one runs out! One of the products that I have to admit I didn’t love is Nail Rock. In theory, the product sounds great! Who doesn’t want a glittery red nail polish to rock out with once in awhile? The reality of the product is a little messier. It requires too many steps and too much precision. First step, put on nail polish. Second step, put on the messy glitter topper. If you are like me and quite untalented at either step, all you will end up with nails that look like they were painted by a 2 year old. It looks like I’ll be sticking with my manicurist when I need a red glitter on my nails. Tea. As a lifestyle extra, I quite enjoy tea or little snacks. However, there was nothing special about these teas. 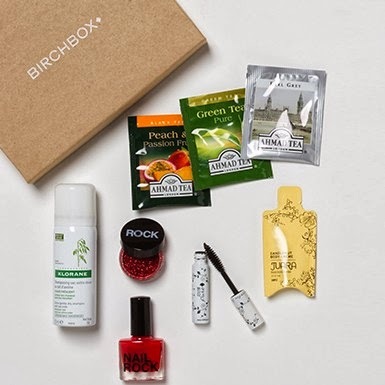 I would hope that the extras that Birchbox would choose to sample in our boxes would be something spectacular. A tea that would make you forsake all other teas. These teas were good, but not that good. I hope that Birchbox tries to aim higher for future boxes. Mascara! I actually enjoy the idea behind this 100% Pure Fruit Pigmented Natural Mascara. I like the idea of a natural mascara, especially for those who search for natural makeup products and can’t seem to find them. However, I don’t think any mascara on the face of the planet will make me leave my Dior Blackout Mascara. It lengthens and volumizes my lashes too much to leave it in the darkness of my makeup drawer, but I respect Birchbox for trying to give natural makeup girls a holy grail mascara. Last stop on the January Birchbox train was the Juara Candlenut Body creme. I really liked the smell of this body creme, but the sample size was quite small so I was unable to test out the cream on my legs. My legs need the most moisture so the fact that I can’t test it out there means I won’t be buying a full size version. I already have so many body lotions that I love, I don’t see a resounding need to add this one to my list. I was not too impressed with their January box, but I am excited to see what Birchbox has in store for February!